by Brianna Crandall — October 8, 2018 — Seville Classics, a supplier of premium ergonomic standing desks, recently announced the expansion of its AIRLIFT line of sit-to-stand desks. 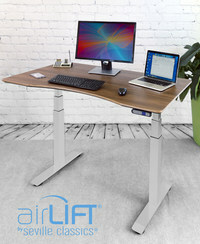 The AIRLIFT line was designed in response to the growing demand for height-adjustable workspaces in corporate, healthcare, government and education environments. Offering more range, the AIRLIFT S3 Electric Standing Desks feature a three-section frame that rises from 24.8 inches to a maximum height of 51.4 inches. In addition, the desks include dual motors that lift up to 264 lbs. at a brisk 1.49 inches per second. The desks also feature a curved desk top (54″ x 30″) that is available in a black, white or walnut finish. A push-button controller stores up to four height settings for quick, consistent adjustment, as well. Launching in October 2018 is the AIRLIFT S3 with gray base, providing users with the option to select between gray, black, or white bases. Seville Classics is also introducing the AIRLIFT Gas-Spring Corner Standing Desk Converter Riser. Seville Classics’ corner converters feature a tapered top that is shaped for cubicles and corner desks. The AIRLIFT gas-spring pneumatic system lifts up to 33 lbs. and provides nearly 12.9 inches of height adjustment. The desk converter also offers an extra-wide desk top (43″ x 23″) that fits multiple monitors and laptops, and includes a detachable keyboard tray. Our main focus has been to provide comfortable, functional, and affordable solutions for our consumers. We are excited to continue this mission with the growth of our AIRLIFT line of height-adjustable solutions and accessories. With these solutions, we are offering options that are cost-effective, durable, and health-focused. 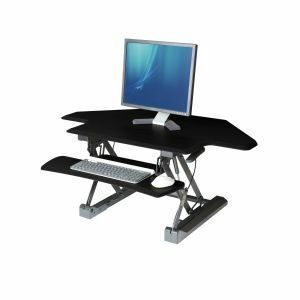 Seville Classics’ AIRLIFT S3 Electric Standing Desks and AIRLIFT Gas-Spring Corner Standing Desk Converter Risers can be purchased from the company’s website.